Last weekend, northeast Pennsylvania’s chapter of the American Advertising Federation (AAF) held its annual awards ceremony at the Radisson Lackawanna. This year, we took a different approach to the event by partnering with Marywood University Associate Professor of Graphic Design, Christine Medley, to sponsor 10 student entries for the competition. Our intent was twofold—to support the Graphic Design Program by providing students with the resources to earn recognition for their work from industry leaders and peers, while also raising their awareness of local advertising and marketing agencies that could offer future employment opportunities following graduation. We’re happy to report that of the ten students who submitted work, four of them took home a combined total of four silver awards and one gold award. In a highly competitive industry like advertising, these students are already poised for prized design roles at the firms of their choice. 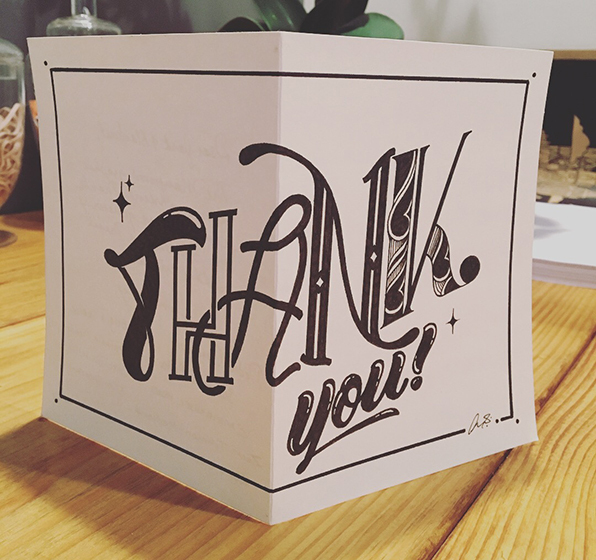 If the beautifully hand-lettered thank you card they created for us is any indication of their attention to detail and keen sense of design, we would be fortunate to add their talent to our team in the near future at BlackOut. We relished the opportunity to support the next generation of design talent and look forward to continuing this commitment to support another 10 students next year.